Has the enhanced resilience and resolvability of large banks reduced the likelihood of another financial crisis or increased it? The primary focus of post-crisis financial regulation has been to make large bank holding companies – that is, banks and their non-bank affiliates – more resilient and resolvable. The former includes sharp increases in capital requirements and first-of-their-kind liquidity requirements that have dramatically increased liquidity levels. The latter includes a reinvention of how such companies are resolved as a legal matter as well as the issuance of more than $1 trillion of so-called “bail-in” debt to make such resolution a practical reality. Those changes have focused almost exclusively on larger banks – those with $50 billion or more in assets. Much of the debate about post-crisis regulation is whether those requirements, when viewed holistically, are under- or overcalibrated and whether their costs are worth their benefits. In this issue of Banking Perspectives, we attempt to answer a somewhat broader question: Has the enhanced resilience and resolvability of large banks reduced the chances of the next financial crisis – or actually increased those chances? Of course, those reforms certainly have reduced the chances that a large bank or its non-bank affiliate will cause or propagate such a crisis, which leads many to assume that the chances of a financial crisis are lower. But financial crises are about collapses in asset prices and unpredictable (and unpredicted) contagions and connections. Only six weeks before the Lehman bankruptcy, in early August 2008, both the Federal Reserve and professional forecasters predicted continued growth of the U.S. economy. Contrary to that prediction, the U.S. financial system nearly melted down after the Lehman bankruptcy, and the economy slid into a deep recession. From a distance, it is difficult to understand the monomaniacal focus of post-crisis regulation on large commercial banks and their non-bank affiliates, and the indifference or even enthusiasm with which regulators have watched much commercial banking and trading move outside the regulated banking sector. One of the many intriguing parts of the article in this issue by Anil Kashyap, Dimitrios P. Tsomocos, and Alexandros P. Vardoulakis is a disclaimer at the beginning: “Throughout, we will refer to these institutions as banks, but understand that non-banks may often also undertake some of these activities, and it is often conceptually hard to explain why regulations are based on organizational form rather than function.” Indeed. I’ve periodically asked people the following question, “Is Goldman Sachs subject to enhanced prudential standards and a G-SIB surcharge because of the risk that its commercial bank will impose a loss on the Deposit Insurance Fund or because of the systemic risk inherent in its non-bank broker-dealer?” The answer has been the latter, without exception. And yet, if that is the case, why are significant players in the financial markets unaffiliated with a bank not subject to such standards – and indeed not subject to any prudential standards at all? Meanwhile, bank regulation becomes more and more complex over time, leading to more restrictions, whether through regulation (overt) or examination (covert). In their article, Kashyap and his co-authors find that when a standard economic model of banking is expanded to reflect a broader range of services that banks provide (for example, providing deposits and making information-intensive loans), the results indicate that multiple regulatory requirements are needed to get the socially optimal outcome. This seems intuitively correct. The issue, though, is the cost of a multiplicity of rules aimed at only 15 to 20 financial institutions and their activities. There are two main costs. First is a reduction in the level of economic activity, which is inarguable, yet rarely acknowledged in regulatory proposals or academic work.4 (For example, while in their book, Gennaioli and Shleifer note that various factors lead to increased risk of financial instability – such as securitization and innovation – they do not acknowledge that there may be a societal cost to constraining those factors.) Second, and the focus here, is a possible shift (as opposed to reduction) of risk to those who may be less able to manage it – either non-bank financial companies or consumers or non-financial businesses – or to government-guaranteed securities for which taxpayers directly bear the risk. We already see evidence of this in numerous markets. Non-banks originated more than half of mortgages in 2017 and account for about 80% of originations of mortgages insured by the Federal Housing Administration and the Department of Veterans Affairs. Moreover, non-banks are vulnerable to liquidity pressures both at origination and during the servicing of such loans; thus, non-bank failures could be quite costly for taxpayers. Banks are shifting out of holding the term part of leveraged loans, which are largely funded instead in collateralized loan obligations and non-banks now dominate home lending to low- and moderate-income (LMI) borrowers. Moreover, small-dollar lending to LMI communities is increasingly being done by non-bank lenders. Market depth in corporate securities markets has diminished and as bank-affiliated broker-dealers hold less inventory the capital cost of holding and hedging inventory has risen. In sum, post-crisis regulation has forced banks and their affiliates to manage fewer risks for the economy, leaving those risks either to be managed by non-bank financial companies; not to be managed at all, and thus retained by non-financial firms; or held by the government. What is of even greater concern, though, is how markets will behave in the next financial crisis. 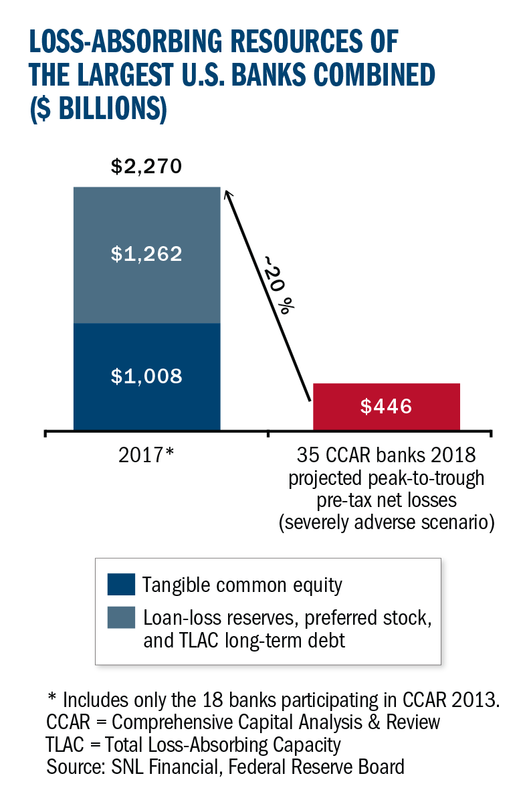 The impact of these buffers can best be seen in this chart, which compares the projected peak-to-trough pre-tax net losses from the Federal Reserve’s recent CCAR stress (in red) with the amount of capital held by the CCAR blanks (in dark blue) and the amount of loan loss reserves and bail-in debt – that is, debt readily convertible to capital – held by those banks (in light blue). Thus, if one reads the red bar as the amount of capital necessary for the largest banks to survive a financial crisis even worse than the global financial crisis of 2007–2008, which is how the Federal Reserve calibrates its stress scenario, then you can see that the affected banks hold a mountain of buffer. If those buffers will never be used, they represent a significant drain on banking activity and economic growth. The rationale for these buffers is that when stress occurs, banks will treat these them as buffers, not legal or practical minimum requirements, and therefore allow their capital levels to drift down toward regulatory minimums in order to remain engaged in lending, market making, and other activities that support the economy. They will also use their buffers to acquire troubled firms, or their assets, lessening fire-sale risk. This belief is an important foundation of post-crisis capital (and liquidity) regulation. Indeed, one could say that is the most important foundation of post-crisis capital (and liquidity) regulation. Unfortunately, I’ve never met a market participant who believes it. Rather, market participants universally believe that banks will never allow their liquidity and capital levels to drop, even if that means shrinking their balance sheets and turning away deposits. In his article, Douglas J. Elliott describes those reasons ably. He provides what I think is an important insight, namely, “[I]t’s possible that the key to predicting actions by banks and their key constituencies is not the total level of capital and liquidity but the margin of capital and liquidity above regulatory minimums. If so, the recession-related risks have likely become higher, not lower, as a result of the increased requirements.”5 My colleagues and I have a less eloquent phrase we use to express the same thought: the Great Buffer Fallacy. As an early adherent of behavioral economics and the work of Kahneman and Tversky in particular,7 I believe that work can have valuable contributions to financial regulation. We publish here an article that examines how our innate biases make it difficult for us to foresee crises – something readily observed in recent financial crises. I think a far more significant application could be toward how buffers would work in practice, which reflects how banks and regulators would behave. Why would a bank in the midst of market uncertainty and regulatory scrutiny choose to report that it was no longer in compliance – or, put another way, no longer able to comply – with its regulatory capital and liquidity buffers? For that matter, would a regulator in the midst of market uncertainty publicly allow a bank to do so – for example, by lowering a previously imposed countercyclical capital buffer? Anecdotal evidence and some back-of-the-envelope game theory seems to suggest that they would not. 1 Nicola Gennaioli and Andrei Shleifer, A Crisis of Beliefs: Investor Psychology and Financial Fragility (Princeton, N.J.: Princeton University Press, 2018). 4 A reduction in economic activity is the cost of higher capital requirements used in studies of the optimal level of capital by the BIS (2010), the Bank of England (2015), the IMF (2016), the Minneapolis Fed (2017), and the Federal Reserve Board (2017). 5 It is worth noting that the countercyclical capital buffer was designed with the intention that regulators would lower it in times of financial stress, and Elliott therefore believes it is worth further study as a potential compromise in this area. Of course, this means that the buffer will be imposed sufficiently ahead of time – that is, that the same regulators who could not identify a looming crisis a few weeks ahead of its advent last time will do so a year or more ahead next time – and that they will have the political courage to tell the American people and the Congress that their response to an actual, ongoing crisis is to lower the capital requirements on large U.S. banks. 6 “The Future of the Federal Reserve’s Balance Sheet,” Vice Chairman for Supervision Randal K. Quarles, speech at the 2019 U.S. Monetary Policy Forum, sponsored by the Initiative on Global Markets at the University of Chicago Booth School of Business, New York, New York, February 22, 2019. 7 G. Baer and G. Gensler, The Great Mutual Fund Trap (New York: Random House, 2002), 170-75. 8 “The Undoing Project: A Friendship That Changed Our Minds,” Michael Lewis (W. W. Norton & Company, 2016).